Setting new standards in standard architectures. Tracewell has extensive experience designing and manufacturing systems based on standard architectures including VPX, VXS, VME, VME64x, VXI, ATCA, MicroTCA, and CPCI. 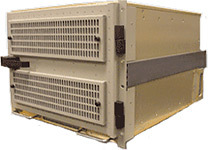 The Tracewell System Architecture (SA) products, based on standard, commercial technologies can be used in a wide variety of commercial and military applications including: battlefield command & control systems, ground and flight sensor control systems, vehicle navigation controls, and medical imaging devices. Tracewell has designed the SA products to minimize size and weight, while maximizing performance. A rugged design of aluminum and steel provides structural strength, without adding excessive weight. These products are also designed to maintain optimal power and cooling conditions inside the chassis. With 40 years experience in bus architecture design, the Tracewell System Architecture products can integrate multiple bus architectures onto one chassis to deliver greater speed and performance. These advanced architectures deliver a smaller, lighter and more cost-efficient computing footprint. The ideal test and development platform for industrial, military, data and telecommunication applications. 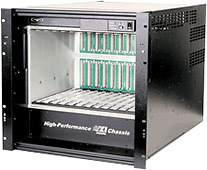 The open-frame design provides unrestricted access to installed boards, eliminating performance robbing extender cards. 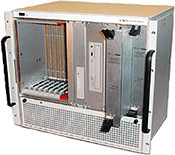 The Tracewell S32 4U is a rugged rack mount or bench top system designed for commercial or industrial applications requiring a large number of instruments in a single chassis. 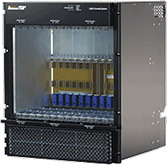 The Tracewell S33-1U is the industry’s highest performance 2-slot 1U CPCI/VME64x chassis. The CompactPCI versions are available in 5 and 8-slots. The VME64x versions are available in 5 and 7-slots. The S33 4U from Tracewell Systems delivers innovative design and performance in a low profile, cost effective platform available in standard configurations for commercial, industrial, and telecommunication applications. 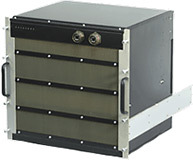 The S34 9U is designed for applications requiring additional power and cooling capacity. Rugged construction and a host of standard features make S34 ideal for any high-performance computing requirement. Tracewell Systems offers the highly adaptable S36 for air-, sea- and ground-based applications. 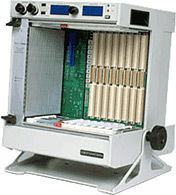 The MIL-STD-461 design uses unique shielding methods to support up to 21 boards. Optional advanced welded laminate construction provides a very light, highly rigid platform. Also supports several standard backplane architectures, or, if needed, full custom architectures. The Tracewell S42 21 slot is an ultra-performance computing platform for rugged applications requiring small size and extreme low weight. The Tracewell HPC VXI 10U is the industry’s highest performance 13-slot, C size VXI chassis. Featuring increased power and cooling, system monitoring, and a rugged modular design, HPC VXI is ideal for the latest generation of high-performance VXI instrumentation. Systems deliver low cost of ownership with superior reliability, availability and maintainability.